Corsair recently announced the release of a new 64GB flash drives. 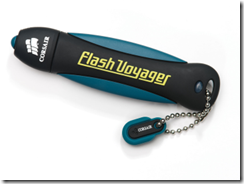 The new 64GB USB Flash Voyager has enough capacity for a library of HD movies. This is actually more space than my laptop or my gen 1 Zune. I am assuming that the next generation of Zune and iPod flash devices will match this much needed growth in capacity. Here is a full datasheet on the Corsairs Voyager line.